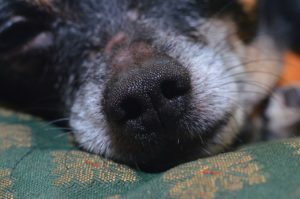 Managing pain and mobility issues can be one of the most challenging problems facing caretakers of senior dogs. Don’t settle for having a pet in pain before exhausting every avenue available. Many pet owners are unaware their pets are suffering from pain; most pets don’t moan or whine, even though they are painful. or inability to get outside quickly enough to eliminate appropriately. One of the biggest mobility issues facing seniors is the ability to walk on slippery surfaces like tile, laminate, or wood flooring. When the dogs walk on these surfaces they will automatically try to grip with their toes, resulting in grabbing with the nails, losing pad contact with the floor. Since the nails cannot penetrate the hard surface, the dogs slip. There is a great product called “Toe Grips”, which are a small hard rubber band, that can be slipped onto the nails. When the dogs grip the floor, the rubber comes into contact with the hard surface, reducing slippage. The grips are easy to apply and remain in place for 6 to 8 weeks. Alternatively, boots can be applied, but boots must be taken off and cannot be left on permanently. Senior pets may have more difficulty getting on and off furniture and beds. They should not be allowed to jump down from furnishings, as they are more prone to injury and falls. Use puppy stairs, ramps, or steps to help your pets reach higher surfaces. for owners. There are many brands on the market and you should choose one that is comfortable for both you and the pet. 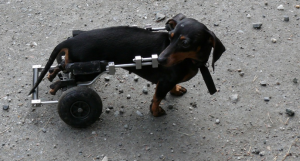 Two and four-wheeled carts are available for dogs with paralysis or paresis. Most pets enjoy the new-found freedom of the carts, but others will not enjoy the carts and prefer to drag themselves around. Each pet should be allowed to choose their own level of mobility. and legs. 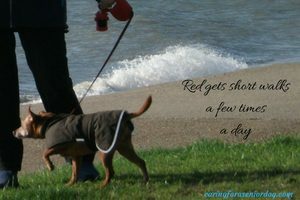 These pets should not be exercised heavily once or twice a week; rather they should be exercised moderately every day. Pain can be managed in many ways for these pets. Cold laser therapy, acupuncture, chiropractic manipulation, massage, and energy work are all beneficial. Because these therapies are becoming more commonplace, it has become easier to find veterinarians and practitioners offering these services. Any, or all, of these therapies can be used in combination. Sometimes severely painful animals will require multiple modes of treatment. Herbal supplements including boswellia, yucca, licorice, and nettleleaf can provide relief. Turmeric is especially popular, but needs to be made into Golden Paste to provide maximum absorption. Simmer turmeric and water over low heat, stirring for 7 to 8 minutes. Remove from heat and add oil, pepper, and cinnamon. Feed 1 tsp/20# twice daily. I like to make a batch and put it into small silicon ice cube trays. I can pop out one cube per day to add to my dog’s meal. Joint supplements containing glucosamine, chondroitin, MSM, hyaluronic acid, vitamin C, and omega 3 fatty acids, are beneficial. Be aware that not all supplements are created equally and some may be no better than placebos. Look for products that have scientific research backing them. One of my favorite new products is New Zealand Deer Antler Velvet combined with green lipped mussel. This product provides omega 3’s, glucosamine, hyaluronic acid, chondroitin, collagen, and proteoglycans in one tablet. Injections of PSGAG’s (polysulfatedglycosaminoglycans) provide the building blocks for joint cartilage and joint fluid, preserving and healing arthritic joints. The injections are available through veterinarians. Cannabidiol, or CBD oil, is helping many senior pets with arthritis pain. The oil is available in the form of treats, capsules, pills, or drops. Again, not all products are created equally. While CBD oil is safe for dogs, cannabis is NOT safe and can cause severe side effects in relatively small doses. 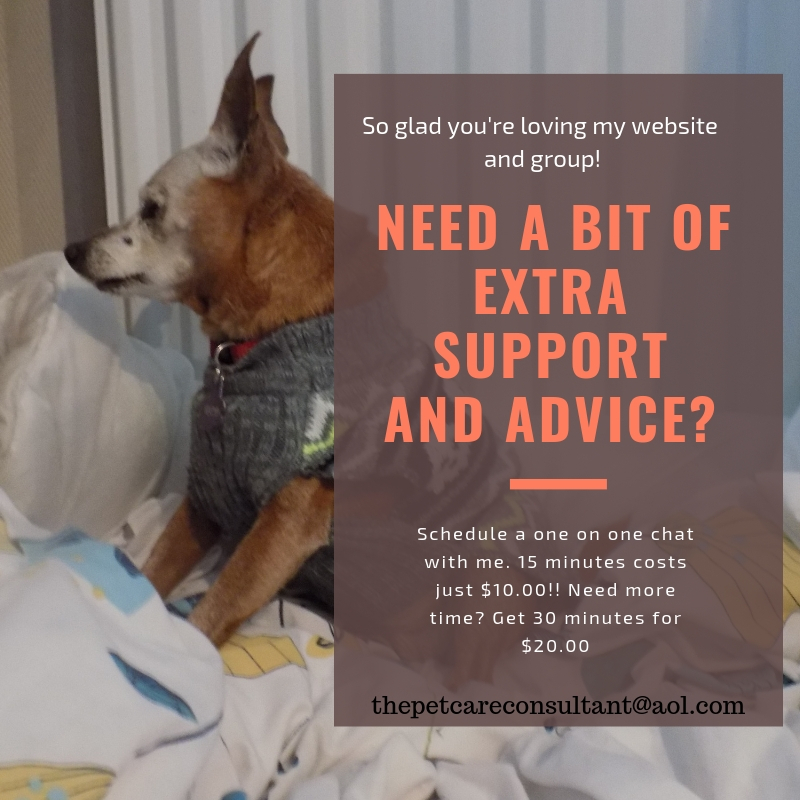 While I prefer to use natural remedies to treat pain, I will not withhold drugs from senior pets in pain. 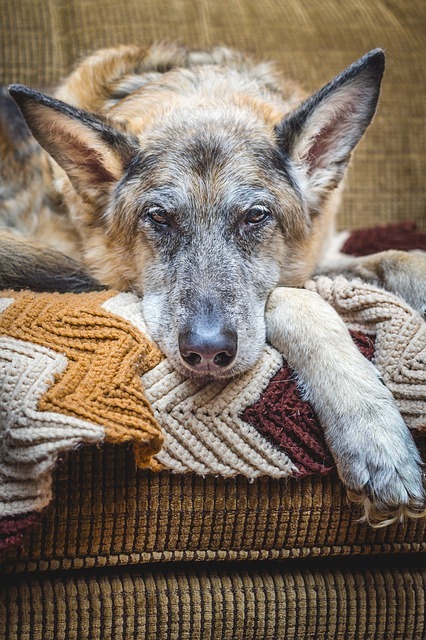 NSAIDs can have dire side effects and should be used with caution, but if owners are aware of the possible side effects, they can be used safely. Any decrease in appetite, nausea, increased thirst, diarrhea, or bloody stools should signal a problem and the drugs should be discontinued. Never use over the counter human pain remedies, as many of these are toxic for dogs and cats. Other drugs that can be used include tramadol, gabapentin, amantadine, and opiate derivatives. Arthritis pain that is worse in winter will be helped with warming; apply warm compresses or provide warming beds for sleeping. Arthritis pain that is worse in summer will improve with cool compresses or cool water hosing. Keep your seniors happy and pain free so they can enjoy their life!